Most people today are quite tired of the ready made trophies given in any competition or awarding ceremonies. At Jojo Vito Designs Gallery we made costume made trophies or plaques for any occasion. As part of our service to our customers, I do the designs personally as most clients would come to us with nothing in mind. Its easy to design for customers but of course we always take into consideration the budget our customers are willing to spend. Just 2 days ago I was asked by Mhel Sillador, past Division D Governor of Toastmasters International to design a trophy for an Area Speech Contest. His budget is quite modest but of course we don’t also want to create something which will disappoint any recipient during the competition. 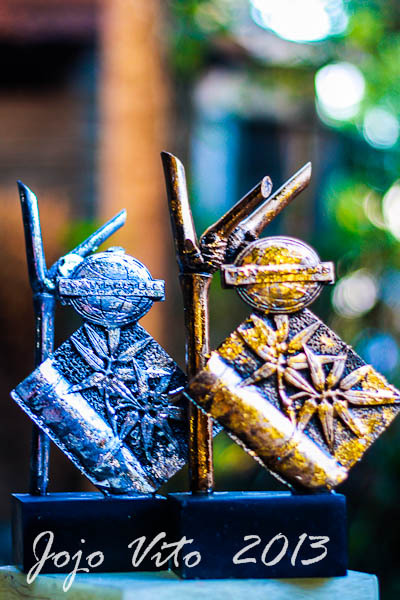 So, I thought of using an indigenous material (bamboo) available locally to come up with an art piece trophy. We added a relief sculpture of bamboo leaves and the Toastmaster’s logo using fiber glass. For the champions we rendered the trophy in antique gold with gold leaf and antique silver with silver leaf of the runners-up. Bamboo plants have been considered a sign of good luck by many cultures throughout Asia for thousands of years. This “lucky” plant is featured in the creation stories of several countries, including the Philippines and Malaysia. The Lucky Bamboo plant also symbolizes friendship in India, while China sees the plant as a symbol of both luck and wealth. There are several “meanings” of the bamboo plant and reasons that it is so revered .In Confucian thought, the bamboo symbolizes aspects of nobility, including graceful strength and flexibility for the way the bamboo bends without breaking. For your “Awards” needs visit www.jojovito.weebly.com or like us on facebook through this link: Jojo Vito Designs Gallery or better visit our gallery at Metrodome, Bacolod City. You may contact us at (034) 435-1256.